MolinBerry prides themselves on GMO/DAP free flavors. I read something kind of how they’re affiliated with INW…maybe someone can clarify? BTW - this is true care for the community. my friends and I appreciate the work! The fact that they are free of those components is a plus in my book, but affiliation with INW??? If this is true, I may very well have do give them a try. Can you dig up a source for this? Edit: After a quick google, I think I may have found something though it is only a user post on a forum and my (French?) 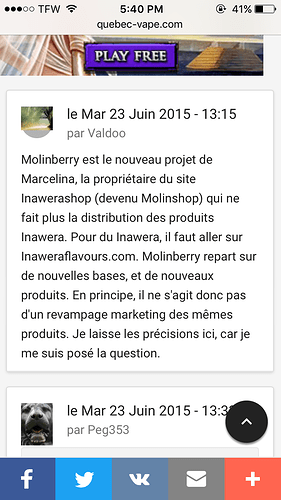 isn’t so good but if I am guessing correctly, I read that the owner of inawera created molinberry on the side? Thx for your kindness. for your I really appreciate it. Marcelina offered an answer here: InaweraShop Company started in 2012 by joining the Inawera Group and distributed Inawera products on inawerashop-dot-com. In October 2014 InaweraShop Company decided to end the business relationship with Inawera manufacturer due to many reasons, which could not allow further co-operation. Our company is placing the greatest emphasis on the product quality, fully professional documentation of products sold and loyalty towards customers. Therefore, from many European manufacturers our company chose to co-operate with Chemnovatic Company, producer of pure grade nicotine, DIY bases and food grade flavours. Customers praise bases purity, flavours intensity, multilanguage customer service at high level, wise DIY bottles & accessories offer. Professionals and business customers are eligible for wholesale programme: reduced prices, customized orders, quick delivery option and support in marketing and promotion of Molinberry & Chemnovatic brand. Otherwise, Molinberry is one of the most transparent companies; they provide all documentation, MSDS and DAAP lab test results for all of their flavors. Industry’s lowest amounts of Acetoin are found in 6 of their flavors only, while there is no D or AP in any of their flavors. All their M-Line is DAAP free. Hmmmm, looks like I’ll be putting in an order today. Lol, it never ends… I just made orders from 3 UK vendors yesterday: Rainbow, Chefs and Depot. Sadly none is offering MB. How many flavors do you have already? 500? That said, until I’ve got more experience mixing and creating, if a recipe calls for it, I’ma use it. Haven’t tried it yet, buuuuut, I plan on trying their Soda Base. Seems nifty, and having bought a soda flavor I was only somewhat enamored with until the very last dregs of the bottle, eh. If it gives me the fizz i’m looking for, why the hell not? @Walt_RealFlavors Idle curiosity, but have you been in contact with Duncan Hunter at all? He’s my local rep, and happens to be a vaping enthusiast. Might be a useful person to cultivate. It’s Marketing in a White Coat. Whatever crop or foodstuff we have excess of that Annual Growing Season is suddenly what’s “good” …So maybe Economist in a White Coat. Too many Soy Beans America? Ooops now too much Corn? Same thing applies for for shortages. It’s Social Modeling …Market Shaping …there must be surplus Butter this year. You should get their Cinnamon Custard! I don’t know why it doesn’t get more attention (and sadly not many recipes can be found), but it is a delicious hidden jewel! I hear their Strawberry Milkshake is another must-have. Ya ain’t wrong. As someone who runs all over his store, including the ammo section…and how often until recently there was a shortage on .22? Yeeeeah, ya ain’t wrong. whelp, if i need cinnamon and that custardy base in a recipe, i’ll nab it. right now, i’m really trying to stick to needs…set up my baseline rotation. THEN I can start getting fancy. Information about Furfuryl alcohol added. This is another example why transparency is in every vaper’s interest. Fortunately we have a fully transparent company like TFA to get these info (we have no idea IF and at what levels Furfuryl alcohol is present in flavorings of other companies). Furfuryl alcohol is used in these TPA flavors. -No additives and sweeteners such as eg cane sugar, sacharose, disaccharides and simple sugars such as glucose, galactose and fructose are used in their flavors. FM - Another completely D-A-AP free company. Find it above. Solub Arome - No diacetyl, paraben or ambrox (300+ flavors; no info about A-AP; note that some Solub flavorings contain oils; check forums regarding this issue). More info in top post. I never talk about prices in this thread, but this might be interesting info for many. A price of any LiQuid (= onepoundliquid) 10ml bottle is £1!!! More info is in the top post. Update: Capella has finally released lab test results of all their v1 flavors! Cake Butter takes the cake for sure. The amount of AP is extraordinary high and more than doubled compared to any other flavor on the market (of the 40+ companies mentioned in the first post). On the other hand, AP in VC1 is very high, but probably lower than expected and levels of AP in other suspected flavors are similar to TFA. Sadly no info about Acetoin.